Every piece of vehicle or alloy wheel damage is different which is why its impossible to provide a rigid pricing structure. Many factors can affect how much the repair of your vehicle will cost. The amount of bodywork panels that have been damaged, the colour of your vehicle, the severity of the damage, the positioning and the expertise involved to complete the repair are some of the main factors which dictate the price we quote to you. Unlike some other companies we do not price down the cost of repairs, just to make them cheap and then use low grade automotive product and shortcuts on workmanship to ‘ balance the scales ‘ which would invariably lead to problems with the external finish of your vehicle. Its with this philosophy in mind, that we ask all our customers to provide us with images of their damaged vehicle or wheels so we can assess and advise accordingly, whilst ensuring our fixed priced quotations are competitive and good value for money. Our well appointed vehicles carry all the equipment needed to carry out a wide range of cosmetic car repairs and because our service is fully mobile, we can service you at your home or work in many parts of London, Hertfordshire, Essex, Surrey, Kent & Sussex at a time convenient to yourself. Our service is fast, friendly and cost effective and we are retained by a number of commercial partners, including major car dealerships, car leasing agents, insurance companies and fleet management groups who value our high quality workmanship and our excellent customer service, which in combination, allows us to provide the very best experience when using our services. 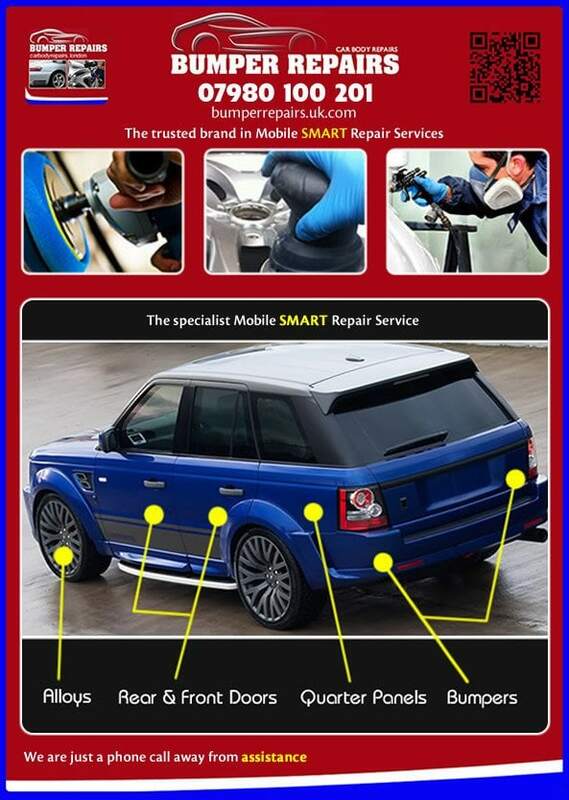 We are committed to providing the very best in mobile car body repair services and our experienced and professional vehicle service technicians can complete a range of car body repairs to remove bumper scuffs, paintwork scratches, bodywork scrapes, scuffed paintwork, small cracks, vandal key scratches, minor dents, alloy wheel scratches and more, whilst saving you money and repairing your vehicle to a high standard.. 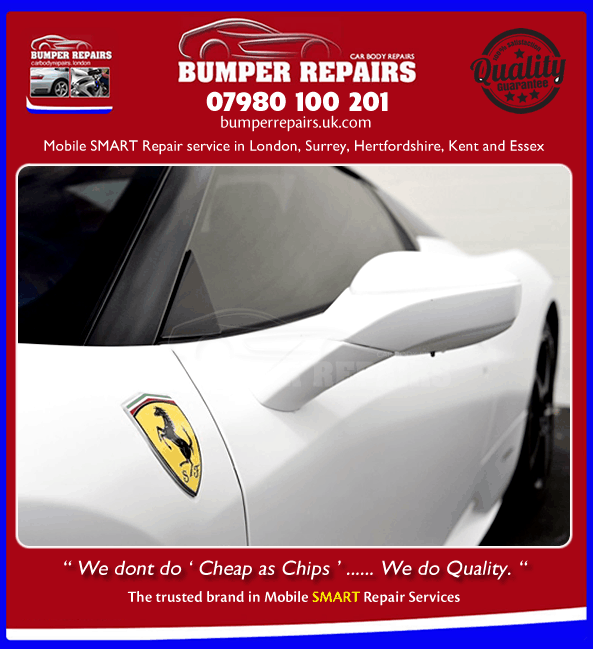 If you would like a free no obligation quote, please feel free to send us an email with a picture of your vehicles bumper scuff, crack, dent or scratch damage or call 0203 432 1790 and one of our dedicated customer service team can arrange an appointment with one of our experienced technicians.